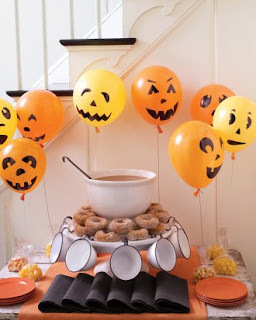 Pumpkin Balloons ~ A gaggle of helium-filled jack-o'-lantern balloons hovers near the refreshment table. The simple features are drawn onto the inflated balloons with permanent marker. Choose an assortment of geometric shapes that are easy to create freehand. 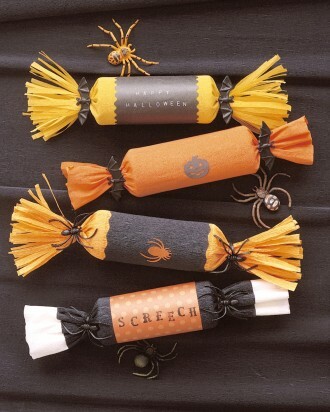 Halloween Crackers ~ You will need: Crepe and colored papers, Scissors, Stickers or rubber stamps, Toilet-paper rolls, Glue stick, Twine and Plastic spider or bat rings Instructions: 1. Cut an 11-inch square of crepe paper and a 4-by-7-inch piece of paper in another color; decorate with stickers or stamps. 2. Roll crepe paper around a candy-filled toilet-paper roll; glue seams closed. Wrap paper rectangle around center; glue. 3. Tie ends with twine; snip for fringe. Slip rings over twine. Pull ends to break open. 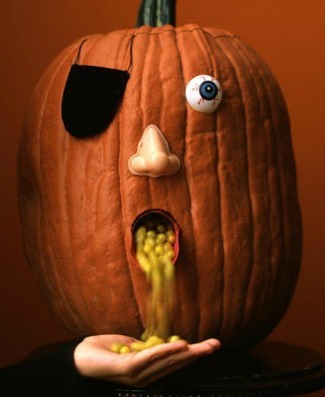 Jack-o'-Lantern Party Favors ~ These goofy jack-o'-lanterns make sweet party favors. Print clip art on card stock and cut out. 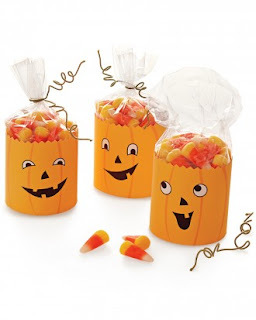 Trim top edge with pinking shears and use invisible tape to secure it around a little bag of candy corn. Curl cloth-covered floral wire around a pencil to create a "stem," and use to close bag. Pumpkin Favor Pouches for Halloween ~ For party favors or treats on Halloween night, fill crepe-paper pumpkin pouches with tiny toys and candy. 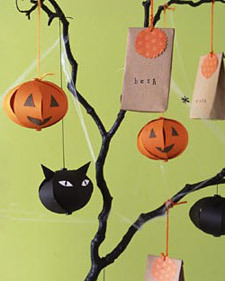 Bewitching Tree Decoration ~ Scare up fun at a Halloween party with a centerpiece that displays favor bags and seasonal ornaments. Branches hold candy-filled bags for guests to bring back to their lairs. For the tree, spray paint a branch black ~ Wedge into a flower bucket filled with rocks. Cover with Spanish moss, and stretch craft-store cobwebs between branches. For the ornaments and favors ~For each ornament, trace a template onto construction paper seven times. Cut out. Stack pieces, and punch holes through both ends with a small hole punch; insert a black or orange paper fastener into each hole. Bend stack into a C shape; fan out pieces to form a globe. Glue on paper features (for cat's ears, fold bottom under to make a tab). For favors, stamp mini paper bags with names. Using pinking shears, cut traced circles out of paper. Fill bags; fold over tops. Place a circle on each; punch a hole through all layers. Tie on yarn for hanging. 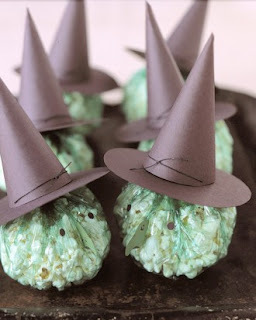 Goody Witches ~ You will need: Popcorn, Green cling wrap from grocery store, or green cellophane, Waxed twine in black, Templates, Construction paper in black and green, Micro hole punch, White craft glue and a standard hole punch. Instructions: 1. Wrap a handful of popcorn in cellophane to make a ball. Tie top with a 6-inch length of twine. 2. Photocopy a brim and cone template and shrink as desired; cut out. Trace onto black construction paper; cut out. Use a micro hole punch on either side of brim's inner circle. Fold cone; staple. 3. Punch a small hole on each side of cone. Place brim on top of popcorn ball; pull twine through holes. Place cone on top of brim, threading twine through cone's holes. Knot twine in front of hat. 4. Photocopy nose template; shrink as desired, and cut out. Trace template onto green construction paper; cut out. Use standard hole punch on black construction paper to make eyes. Attach the features with glue. Creepy Custom Favor Bags ~ You will need: Cellophane bags, Heavyweight paper or card stock, Craft edge punch, Halloween rubber stamps, Ink pad, Double-sided tape, and Candy. Instructions: 1.Cut heavyweight paper or card stock slightly wider than your cellophane bags. Clip one edge with a craft edge punch. 2. 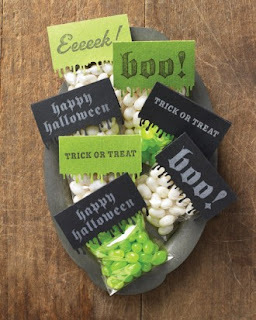 Fold label in half; stamp with a Halloween message. 3. Fill cellophane bag with candy. Fold the bag's edge down once to close, and secure the label on both sides with double-sided tape. 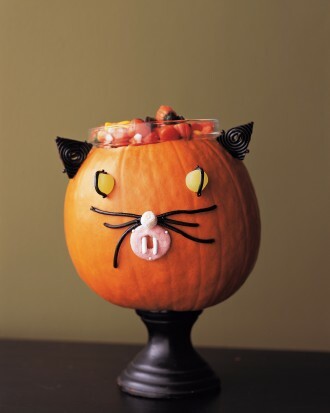 Cat Candy Container ~ Adults can use a serrated knife to saw open the top and thin out the rim -- then let kids get creative by creating a creepy cat with licorice whiskers and ears and yellow gumdrop eyes. Halloween Hang-Ups ~ You will need: Pumpkin template, Owl template, Cat template, 8 1/2-by-11-inch sheets of colored paper, Glue stick, Hot glue gun, Hole punch, and Ribbon. Instructions: 1. For each decoration, you'll need to accordion-fold 8 1/2-by-11-inch sheets of colored paper, making 1/2- or 3/4-inch folds. For small faces, accordion-fold 3 sheets of paper vertically, then bend each in half to make a fan. For medium, accordion-fold 6 sheets horizontally. For large, accordion-fold 11 sheets vertically. 2. For small faces, cut 6 strips of paper equal to length of fan's fold and twice its width; fold in half lengthwise. Use a glue stick to attach strips to fans, and fans to one another, forming a circle. For larger faces, glue 1 edge of folded paper to next until you form a circle. Hot-glue center to secure. 3. 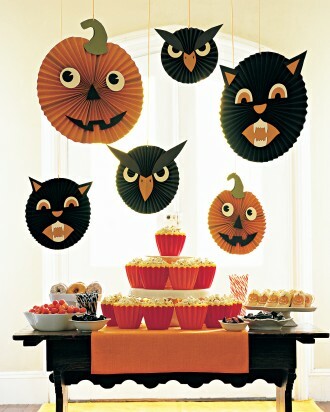 Print templates (pumpkin, cat, and owl, above), enlarging or reducing to desired size. Trace shapes onto colored paper twice; cut out. Attach shapes to each side of decoration with hot glue. Hole-punch top; hang using ribbon. Creepy Candy Containers ~ It's Halloween, and patches are full of pumpkins just waiting to provide spine-tingling thrills on the big fright night. 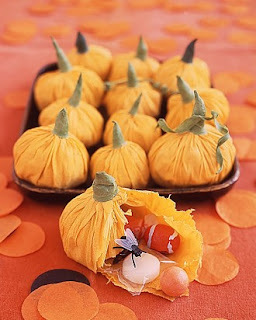 Carving them into jack-o'-lanterns is always fun, but transform a few into candy holders with looks that could chill, and they can play a crucial role as keepers of the goodies.